At Carroll Landscaping, landscape design and landscape architecture are two of our biggest passions. We know that designing a perfect landscape involves more than simply planting flowers and trees that you enjoy looking at. Instead, it involves a comprehensive examination of how you use your outdoor living space, how your existing landscaping and hardscaping can be improved, and how we can transform your yard into something that is a perfect reflection of your family. We are proud to have received numerous landscape design awards over our three decades of business, and we are excited to collaborate with you on our ideas for your landscaping and hardscaping. Every landscape design project we complete starts with a meeting between the homeowner and one of our talented landscape designers. We will walk through your property to assess your current landscaping and hardscaping and discuss your style, needs, and goals. 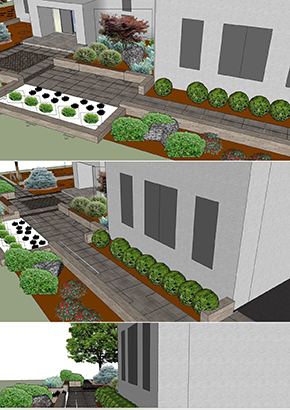 After the meeting, a landscape design team member will draw a detailed design for your yard. We will revise and update your custom landscape design to meet your needs and budget until it is absolutely perfect. Once you approve the final version, the scheduling and installation processes will begin. What Does a Landscaping Design Include? When you choose to enter the custom landscape design process with Carroll Landscaping, you are going to receive a top-of-the-line experience from start to finish. Our landscape designers have a wealth of experience in working at residential properties of any size, working with existing hardscaping and landscaping features, and finding innovative ways to give you exactly what you want. Instead of cookie-cutter designs, you’ll receive a truly custom landscape design that seamlessly integrates with your home’s exterior. Whatever you are interested in incorporating into your yard, we can create a landscaping design that meets your needs.